KPFA Weekend News Anchor Sharon Sobotta: The Green Party campaign for presidential candidate Jill Stein and vice presidential candidate Ajamu Baraka has completed its 2016 ballot access drive. Stein-Baraka will be on the ballot in 45 states, including Washington, D.C., and they will be official write-in candidates in three more states. Ballots cast for official write-in candidates are counted, whereas unofficial write-in ballots are not. Jill Stein and Ajamu Baraka accept the Green Party nomination at the University of Houston, Texas, in August 2016. Ninety percent of voters will see the Stein-Baraka ticket on the ballot. Stein-Baraka are eligible to win 424 electoral votes; that’s 154 more than the 270 required to win. KPFA’s Ann Garrison spoke to Rick Lass, ballot access coordinator for the Stein-Baraka campaign. KPFA/Ann Garrison: Rick Lass, I believe the Stein-Baraka ticket has qualified for the ballot in more states than the Green Party ever has, including even Ralph Nader in 2000. Is that correct? 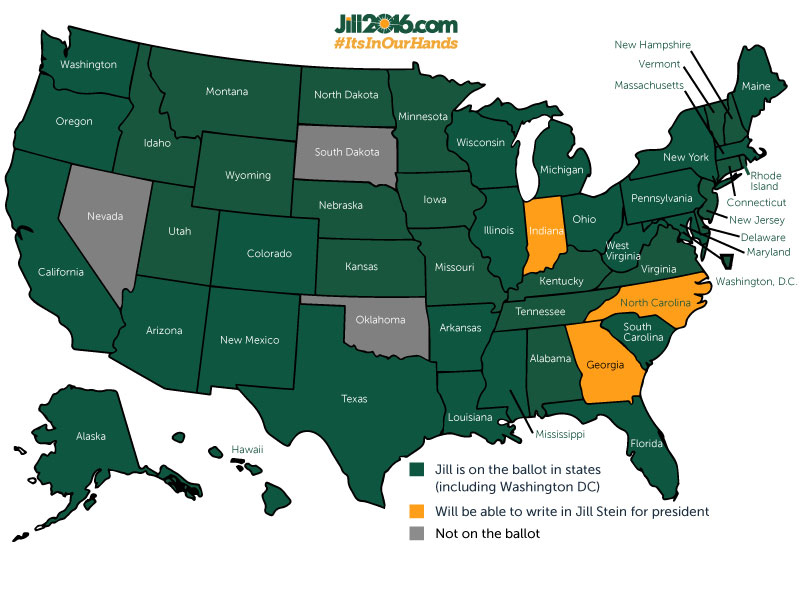 Stein-Baraka will be on the ballot in 45 states, including Washington, D.C., and they will be official write-in candidates in three more states. KPFA: Greens and Libertarians argue that any candidates who have surmounted enough state ballot access barriers to win should be included in the debates, so that voters hear from any candidate who could actually be elected. And 75 percent of voters have said that they would like to hear Greens and Libertarians in the presidential and vice presidential debates. Has this private corporation, the so-called “Commission on Presidential Debates,” controlled by the Democratic and Republican National Committees, shown any sign of listening to the voters about this? RL: Unfortunately, they have not, and, as you point out, this Commission on Presidential Debates is controlled by the Democratic and Republican Parties. And the fact is, year after year, more people are registering either in a third party, so called, or as independent voters because they don’t believe the Democratic and Republican parties are the way that we need to move forward. Year after year, more people are registering either in a third party, so called, or as independent voters because they don’t believe the Democratic and Republican parties are the way that we need to move forward. RL: And the debates, which is really a media circus, unfortunately. KPFA: Right. OK, it’s often said that any party outside the Democratic and Republican duopoly has to spend most of the money they’re able to raise on ballot access. How much of the Stein-Baraka campaign’s resources had to go into the ballot access drives? RL: Unfortunately, we had to spend between $500,00 and $600,000 just to get on the ballot in 28 states in this election cycle. So a huge amount of money and an even huger amount of energy went into the ballot access drives. Now, on the bright side, we had a tremendous number of volunteers working alongside the paid petitioners who were out talking to voters early about Jill Stein, and we were able to get on the ballot, as I mentioned, in more states than we’ve ever been on the ballot before. But we’d rather have that money right now to be doing advertising, to be paying people to getting the word out about the importance of this campaign, and instead we had to put it into just the simple fact of getting on the ballot. KPFA: OK, and will the number of states who already have Green Party ballot access be greater in 2020 than they were in 2016 because of your success this year? RL: Well, I hope so. That remains to be seen. Most states have a minimum vote threshold, so if Jill Stein gets one percent or three percent or five percent of the vote in a given state, then yes, we will have ballot access in that state moving into 2020 but, again, that remains to be seen. The big issue for voters around the country now is, if you want to see the Green Party on the ballot in 2018 and in 2020, vote Green this year. Don’t be persuaded by the “Oh, she can’t win” argument or “Oh, she’s just a spoiler” argument. If we’re going to build a long term alternative to the two-party system and to the politics of lesser evil-ism, we need to start voting Green right now, so that in 2020, we have an extra half a million dollars to spend on getting out the vote and on party building, instead of having to waste it on getting on the ballot. KPFA: And that was Rick Lass, ballot access coordinator for Green Party candidates Jill Stein and Ajamu Baraka. In Berkeley, for Pacifica, KPFA Radio, I’m Ann Garrison. Oakland writer Ann Garrison writes for the San Francisco Bay View, Black Agenda Report, Black Star News, Counterpunch and her own website, Ann Garrison, and produces for AfrobeatRadio on WBAI-NYC, KPFA Evening News, KPFA Flashpoints and for her own YouTube Channel. She can be reached at anniegarrison@gmail.com. In March 2014 she was awarded the Victoire Ingabire Umuhoza Democracy and Peace Prize for promoting peace in the Great Lakes Region of Africa through her reporting.